A mixture of different compounds boils over a certain range of temperature, reflecting the boiling point of each specific compound present in the mixture. For many purposes, it is suitably to calculate an average boiling point (ABP) of mixtures. Gasoline consists of branched paraffins, cycloparaffins and aromatics with carbon numbers typically from C4 to C12. It can be seen that the WABP is biased against the densest components, while the MABP is biast against the lightest components. However, a real gasoline contains hundreds of different compounds with individual properties, and a similar calculation is not possible to performe due to the complexity and lack of precise analytical tools. 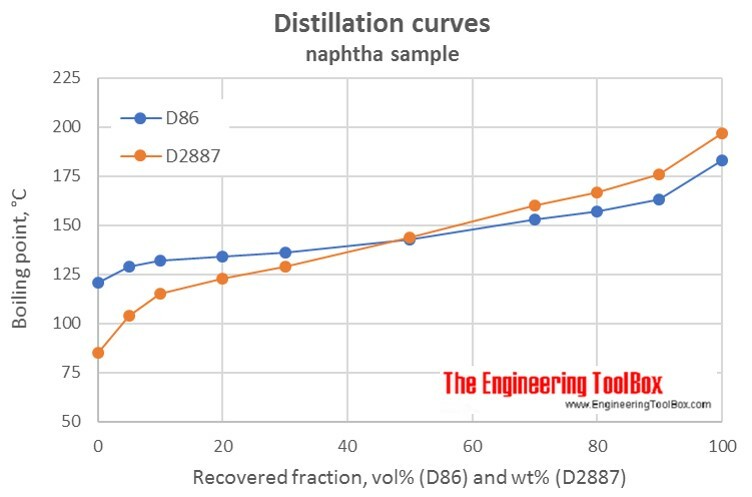 The way to get past this restriction is to use a distillation curve obtained using a real distillation, as ASTM D86, or a gas chromatographic analysis, as ASTM D2887, to calculate VABP or WABP and then, use agreed correction factors to find the other kinds of ABPs. Correction factors are found by using the figures below. Note! The figures are using °C or °F, and results from D86. The narrower the cut of the oil fraction (smaller slope), the smaller is the correction. The figures show that the correction from a VABP of 294°F to MABP is -6°F for a sample with a slope of 0.7°F/% recovered. That gives a MABP of 288°F. Molecular weight from average boiling point and gravity - Formula and examples of calculation of average molecular weight of hydrocarbon mixtures from gravity and average boiling point, achieved from distillation data. Engineering ToolBox, (2017). Average boiling point. 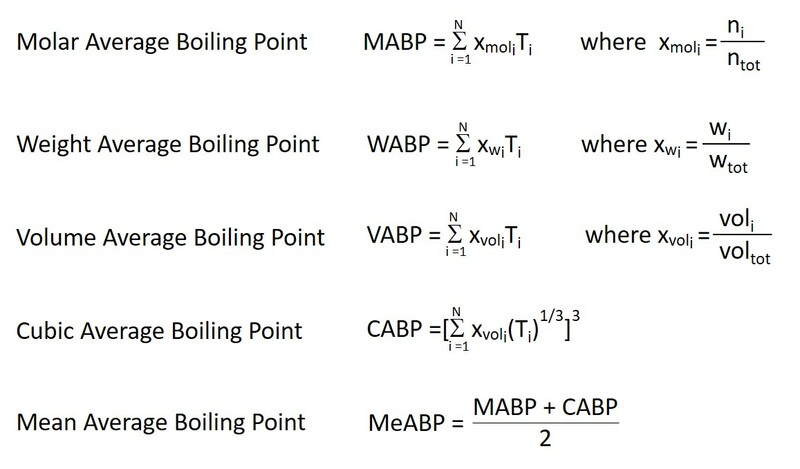 [online] Available at: https://www.engineeringtoolbox.com/Average-boiling-point-VABP-MABP-WABP-CABP-MeABP-formula-d_1994.html [Accessed Day Mo. Year].